Throughout the Fête des Vignerons 2019 from 18th July to 11th August, a vast area from the Jardin Doret to Entre-Deux-Villes will be dedicated, from 9am in the morning up until midnight during the week (2am on Fridays and Saturdays), to entertainment and restoration and to musical and cultural animations. Free animations are available all day as part of the Ville en Fête. 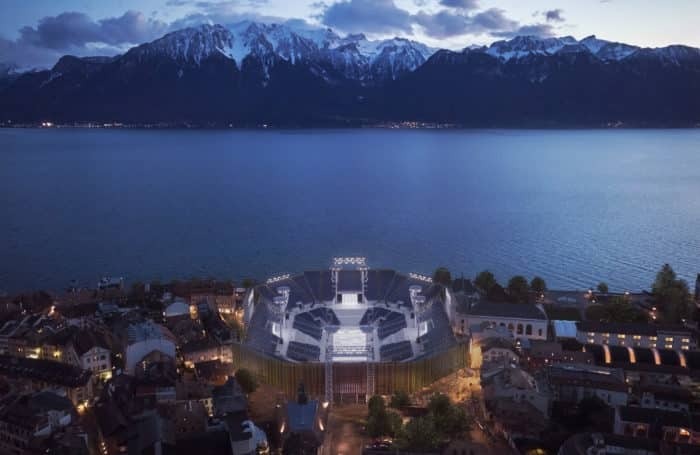 The Ville en Fête will transform Vevey into an open-air musical and theatrical stage: from morning into the night, like a free cultural festival, a dozen stage areas will host concerts, performances and various activities. A space ranging from the Jardin Doret to the Entre-deux-Villes will be completely pedestrian for the duration of the festival and dedicated to conviviality, cultural and festive entertainment. This space, symbolically named the Ville en Fête, offers a dozen stages installed at various locations across town. Throughout the festival, it will host entertainment in the form of traditional musical troups or contemporary bands, theater and, in the evening, DJs. The Ville en Fête is a space to walk around and enjoy this eclectic spirit. In the heart of the Jardin Doret, the Espace Jeune Public will propose every day, several times daily, shows or entertainment for families or children. The Musée des contes et récits will propose “Once upon a time in Switzerland”, tales from each of the Swiss cantons. 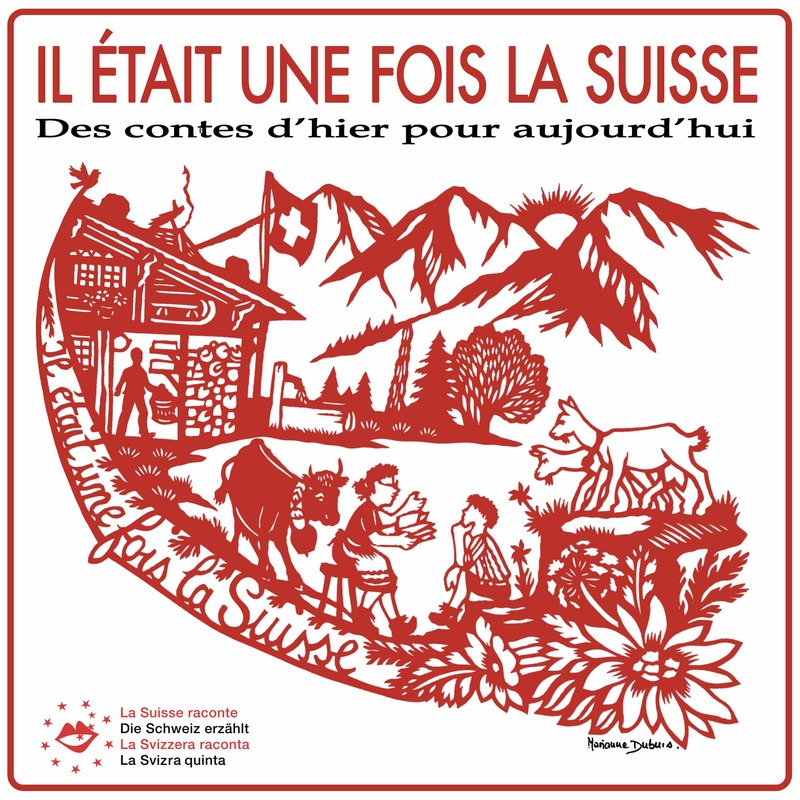 The Musée des contes et récits (a museum of tales and stories) joins the Fête des Vignerons to reveal and pass on to the younger generations a few pearls of the Swiss oral tradition and literature at the Chalet des contes suisses (the cottage of Swiss fairy tales). the “bovine bi-plane”, the “cow angel”, the “bum-bull bee”, the silly rocket, the cow on wheels, the up-side-down cow, the cow dancer, the skating cow, the musician cow, and the swimming cow. Then there’s the Alpine Bestiary, an ecological carousel theatre made of driftwood and consisting of iconic Alpine animals that live above 1500 meters – a wolf, a snipe, a marmot, an ibex, a fox, a yeti, a royal eagle. It comes to life thanks to its presenter, who takes us into his world at every turn, and a swing for parents to push. Then a “Zanimal – the merry-go-forth”, is a new concept: an animal, a child, a parent walking in tow, a whole troupe of lit-up and noisy animals (frog, swan, pig, ladybug, bear, elephant, dragon, rabbit, fox, duck) will be there to greet your little marmots ages 2 and up. The Compagnie Mine de Rien offers for its part “Cinderella leads the dance” and “Snow White”: Joane Reymond, storyteller-wacky clown, wants you to rediscover these mythical tales in a funny and exhilarating version. The Compagnie Octopus landed with his “Mini Playdough Circus”: the largest mini-circus in the world, which can accommodate up to 40 children (maximum height 1m40 or 4ft 5in), comes to the festival equipped with only a few balls of clay to shape with a clever twist of the hand. A treasure hunt for families that runs all over town is Le Passeport de Julie. Le Passeport de Julie is a guide game for families and children ages 4 to 10, created by the Fête des Vignerons in collaboration with the creative agency CullyCully. It brings together activities for young audiences and their families within the Ville en Fête. Families have a guide for specific offers of the Ville en Fête (the Alimentarium, RTS, the festival menagerie, the museum of the Confrérie des Vignerons, etc) and the activities they offer. The treasure hunt engages all the senses, and family collaboration is needed throughout. Young visitors prove they’ve achieved each stage of the course with a stamp in their passport. Starting at the Jardin Doret (with a storyteller) and culminating with the Ferris wheel located at Entre-deux-villes. At the end of the course, a surprise will be revealed to the owner of the passport. The passport is destined to be a true guide within the Ville en Fête, but also a beautiful souvenir for families to remember the Fête des Vignerons 2019. Every night, a poetic and dreamlike Parade de nuit will finish off the day. From the Jardin Doret to Entre-deux-Villes at 9.30 pm on days of the daytime main show, and from the Arena to Entre-deux-Villes at 11.45 pm on days of the nightly shows, it will bring together 30 some-odd actor-performers who will hold a musical parade with illuminated costumes that evoke the seasons of the winemakers. Some 60 Marmousets, adult costumed actor-performers, will welcome and inform visitors in various places of the Ville en Fête. 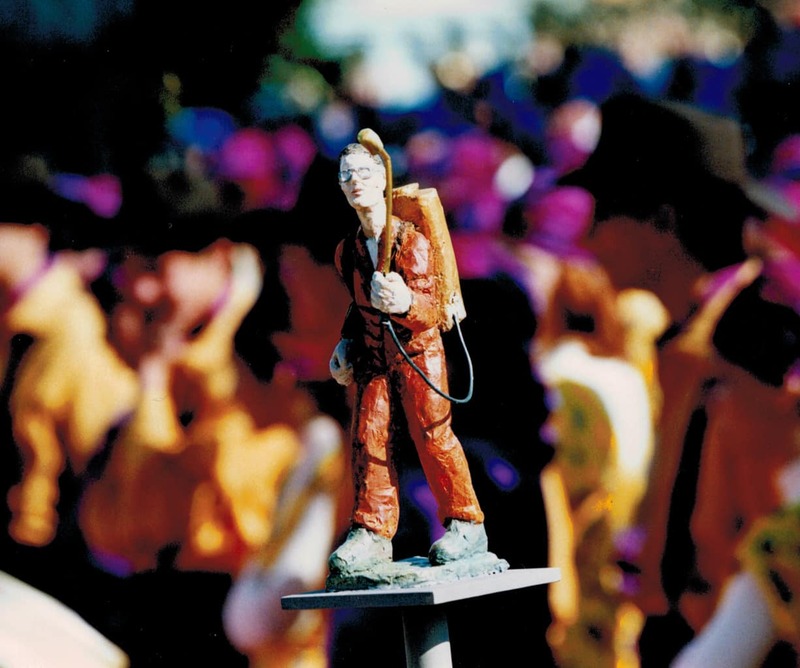 Embodying the festival and its region, the Marmousets carry tall poles topped by figures that represent elements of the festival poster. The Marmosets are as old as the Fête des Vignerons itself: at the beginning of the festival, celebrations and parades were sometimes prohibited by the Bernese who occupied the canton of Vaud back then. In defiance, the winemakers created the “Marmousets”, small figurines with effigies of the winemakers’ hands and tools of their trade. In 2019, the long-awaited processions of historical tradition will be on display. Once again, the processions will pass through one part of town to the next for the pleasure of the Veveysans and spectators from all over Switzerland and elsewhere. Some are as short as 500 metres, but the longest may stretch out 3.5 kilometres. The processions will take many forms, and each is unique. From the parade of the official authorities in the morning during the processions of the Confrérie des Vignerons and the cantons almost every afternoon (depending on individual performances), the festivities will last until the end of the day with an evening parade that will ignite the streets like fireworks. 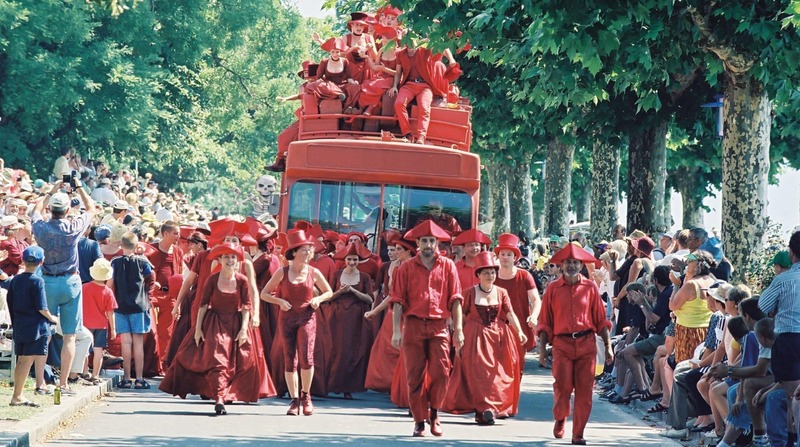 From the costumes of the Fête des Vignerons to the costumes, dances and traditional songs of the invited cantons and their delegations, no two processions will be the same. Free of charge, they are integrated into the Ville en Fête and Cantonal Days entertainment. The first and the largest of all the processions is the Coronation Parade, July 18. It will bring together more than 8000 participants around 2 pm, and pass through the city from the Place du Marché to the Tour-de-Peilz, along the lakefront to then arrive at the Vevey train station and return to its departure point at the marketplace. Les Cent Suisses and the Troupe d’Honneur will proceed with the procession walking to the rhythm of the drums. Thier fife flutes resonate far ahead to announce the arrivals of the winegrowers, who have just been crowned, prized or distinguished. Following them are the Confrérie des Vignerons, but also all the troupes, dancers to starlings, fishermen to master-tailors, with choral and musical harmonies as well as brass bands. Two other processions, including half of the actor-performers will take place Saturday, July 27 at 3 pm and Saturday, August 3 at 3 pm. Twelve cantonal processions are held at 12 pm, 3 pm or 5 pm from Entre-deux-Villes to the Jardin du rivage as well as 13 cantonal parades in the morning. Located in the Jardin Doret, the farm will welcome the animals that are related one way or another to the show and processions, some 40 cows, a dozen horses, a mule and a couple of kids, young goats that is… Next to the stable, a petting zoo will host a sheep, its lambs and some rabbits to the delight of families and children. The public will be able to discover life on the farm: seven people will be present at all times to care for the animals. Visitors will be able to watch the cows getting milked twice daily. Cheese will be made every day on site by the Armaillis de la Veveyse (the local herdsmen) then refined by a Semsales cheese-maker. As in 1999, the canton of Fribourg and the district of the Veveyse will provide its own space during the festival at the Jardin Doret. Under the aegis of Fribourgissima Image Fribourg, the canton of Fribourg will offer a restaurant serving local products, an exhibition space that presents the canton in a contemporary and playful way, and a space for the Fête des Vignerons herdsmen who will take care of the animals and propose events, choirs and other musical entertainment, throughout the festival. The more prominent presence of the canton of Fribourg at the Fête des Vignerons in comparison to any of the other Swiss cantons comes from the naturally close, cultural, economic and agricultural ties that have always existed between Vevey, the district of Veveyse and Fribourg. Under the slogan “Fribourg: happiness and more“, this modern exhibition space will notably include a staging of the seasons and the highlights of the life of the canton as well as an innovative and exciting Live Poy’Art interactive. The restaurant, a large canteen with two floors facing the lake with 500 seats, proposes its fondues, macaroni and cottage soups, cured meats, its famous ham “jambon de la borne”, Vully cake and other regional desserts. 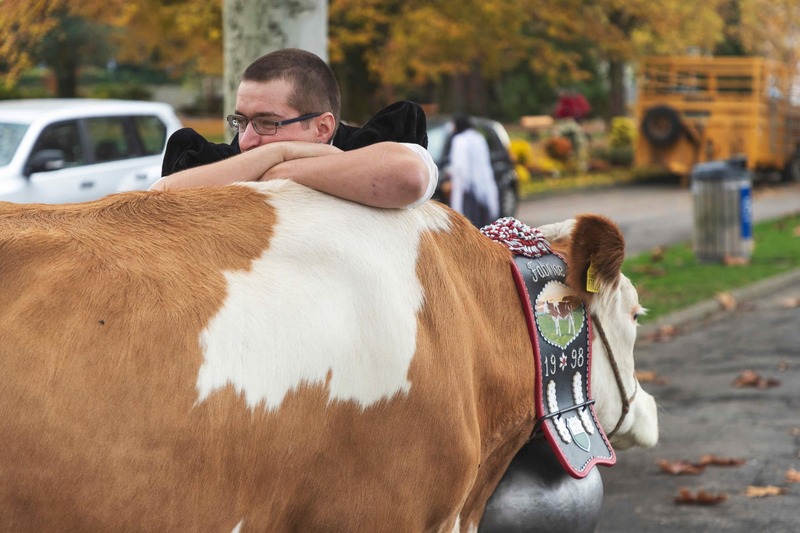 As for the Armaillis de la Veveyse (the herdsmen), they will offer multiple demonstrations of milking cows, making Gruyère cheese, and traditional song in their ephemeral cottage. In addition, the young team at Radio NRV (the new Veveyse radio station) will cover the whole affair with their fresh perspective. The Fête des Vignerons also stands for festive meals, a profusion of delicacies and drinks for all tastes, all budgets and all audiences. Overview of the thousand-course menu that the Fête des Vignerons has concocted, a gourmet festival for everyone. 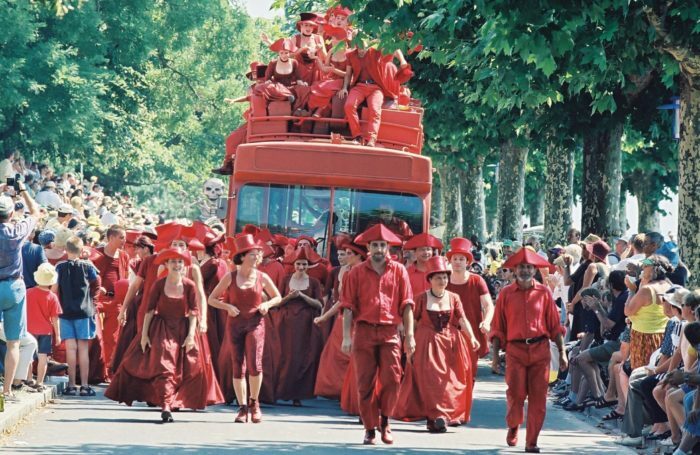 Live the Fête des Vignerons, soak up music, dance, colours, processions and living culture, but also flatter the palate and find the soul of the regions feasting in Vevey on your plate and in your glass all summer. Culinary experience is thus also an integral part of the Fête des Vignerons, which leads the visitor in an immense gourmet round dance. After many months, a qualitative selection was made by a team of professionals and a culinary commission very much motivated to achieve this top-notch and varied offer, but which primarily proposes the desired products of the vineyards of our regions. Culinary culture is thus major attraction of the Ville en Fête. Each visitor will be able to eat and drink, either on-the-go or in an haute-cuisine setting, traditional or exotic, festive or practical, solo or in groups. Each Cantonal Day will be an opportunity for festival participants and Vevey restaurateurs who wish to offer cantonal specialties. Dozens of wine cellars, mythical and unavoidable festival spaces, offer their friendly and casual atmosphere to visitors. Some 50 food and drink stands will be placed in various areas throughout the town of Vevey and offer dining from 9 am to 1 am or even 3 in the morning (Thursday to Saturday). These areas are to be found from the Jardin du Rivage to Entre-deux-Villes along the Quai Maria-Belgia, the Quai Perdonnet, Place Scanavin or Rue Louis-Meyer. The majority of the stands and restaurants offer Helvetic cuisine: dishes with cheese, cold cuts, sausages of our cantons, sandwiches loaded with PDOs and PGIs from our farms and vineyards. Local bakers work with regional millers to produce the best bread and the best buns. Even the burgers will be manufactured with Swiss meat: butchers sharpen their knives for us to chop and dice the best meats from our pastures. To allow visitors to taste whatever they like at their own pace, each stand has tables and chairs, turning it into a restaurant – with the exception of the food truck area located in the Rue du Torrent. The Terrasses du Monde, located at the end of Quai Perdonnet, invite you to travel and offer a taste escape by proposing the excellent flavours of Latin America, Asia or Africa or parts of France and the Middle East. The Terrasses du Monde will be protected from the sun by a leafy canopy, which will give it a unique, pleasant atmosphere. The Restaurants du Rivage, in the Jardin du Rivage, offer four different dining areas on two massive levels – one of which is run by Vaudois country folk. 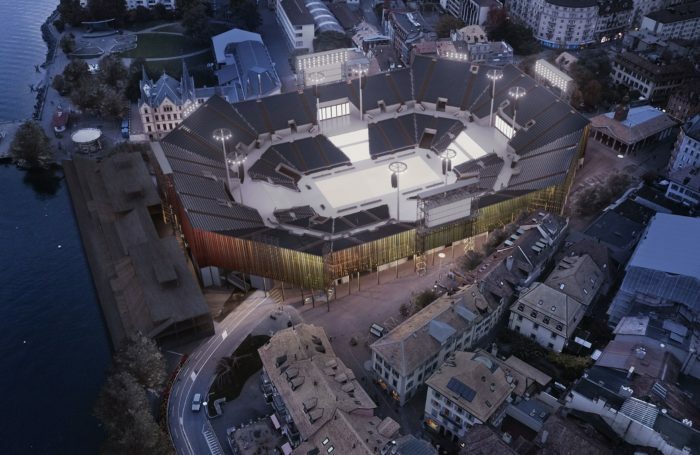 On May 21, the arena barely opened to the actor-performers for their first on-site rehearsals, will unlock an exceptional ephemeral place: the Terrasses de la Confrérie. 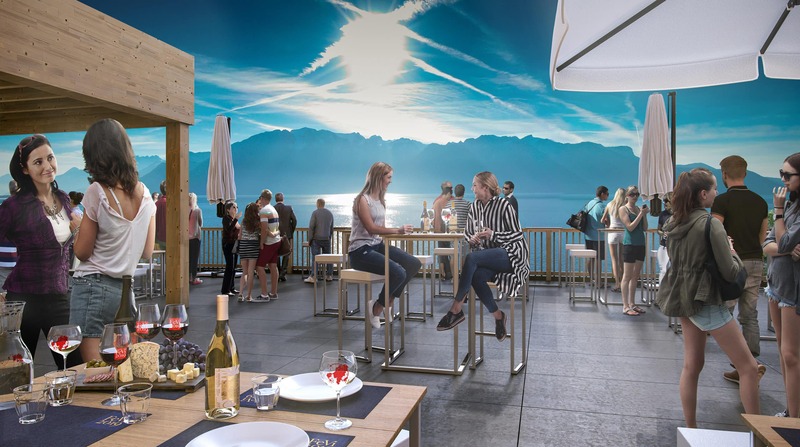 This lake-side platform adjacent to the arena, official reception area of festival, offers an idyllic view of Lake Geneva morning into the night, on three levels and so many different moods, a place to meet up with friends and, of course, to eat, any time. A Vaudois wine bar, a cheese bar, carts of garnished toasts, variety platters, sweets and savoury Vaudois specialities and ice cream for the entire family, a cocktail lounge and finally a rooftop terrace with evening music: the Terrasses de la Confrérie will be the place to be at the event and from springtime onward the right spot to soak up the festival! Specific breakfast offers or cocktails and appetizers are provided for groups from ten people. The cellars are an essential ingredient to the Fête des Vignerons. They are part of its DNA, deeply-rooted tradition in the region and that radiates even more during the festival. Since 1999, they are open to the general public, after having been reserved for the actor-performers up until then. The city of Vevey will issue 60 permits, according to strict safety and hygiene standards, after study of the files which have been submitted to us and with the authorisation of the commercial police and the ECA. The time of submission of application, initially in early March, was extended until the end of the month. Among the cellars having received the approval of the city, 15 will be labelled “official cellars of the Fête des Vignerons”. The majority of the labelled cellars will be cellars dedicated to the troupes such as, for example: les Oriflammes, les Maîtres-Tailleurs, la Noce, les Marins, les Cent pour Cent. These cellars will be part of the culinary offer of festival. 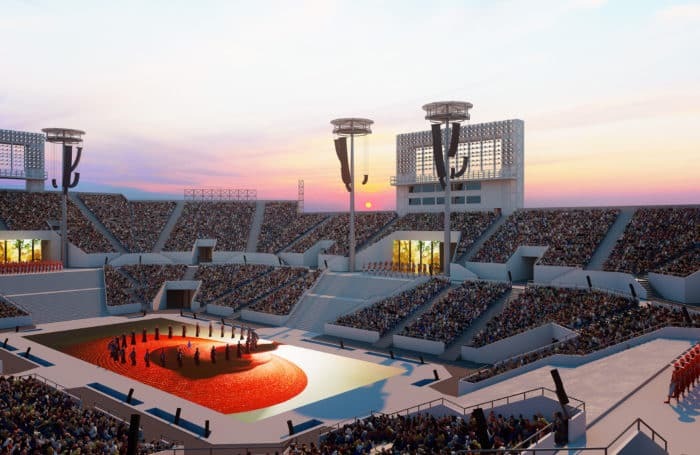 All located within a three-minute walk from the arena, they will propose various, traditional or modern atmospheres. The concepts are all articulated around the theme of the Fête des Vignerons, the vines and the wines. A beautiful decoration on this theme, a welcoming atmosphere and musical programming of choice (including live concerts) are to be expected. Their menu will present the great wines of the region (including the festival wines) and they offer snacks to compliment the drinks. All festival spots, including the cellars associated with the event, will serve the festival wines. 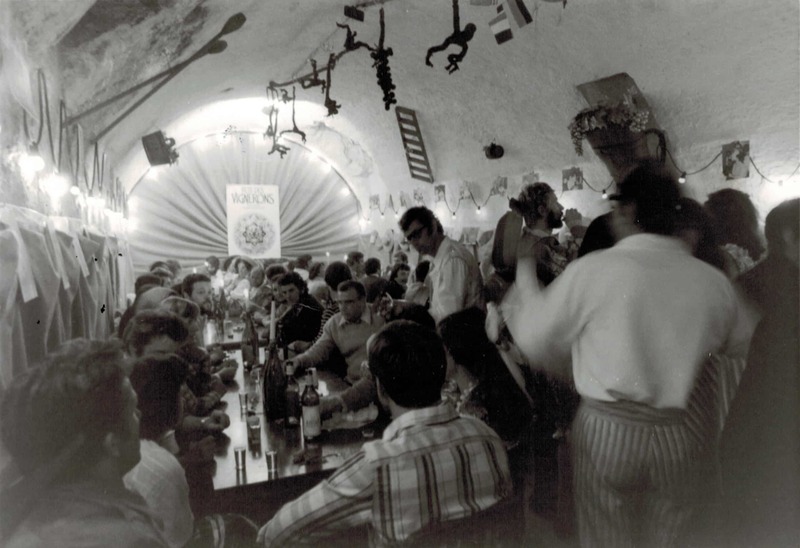 Wine has always been, logically, at the heart of all the Fêtes des Vignerons. Novelty of the 2019 edition: a vintage 2017 of the festival was already released in the fall of 2018, and has seen great success in terms of sales ever since. This was repeated with the harvest of 2018, which will be served once supplies of the 2017 have been depleted. Four wines were developed: a white and a red from Lavaux, a white and a red from Chablais, the two regions of the Confrérie. The Obrist and Badoux wineries provided the production, two iconic houses of Lavaux and Chablais. Two white wines are Chasselas and the red is a classic combination of Pinot and Gamay. In addition to the four wines of the festival, there will be two prestige cuvées. Only in white, either of the Chasselas, from two emblematic terroirs of Lavaux and Chablais: the Dézaley and the Yvorne. 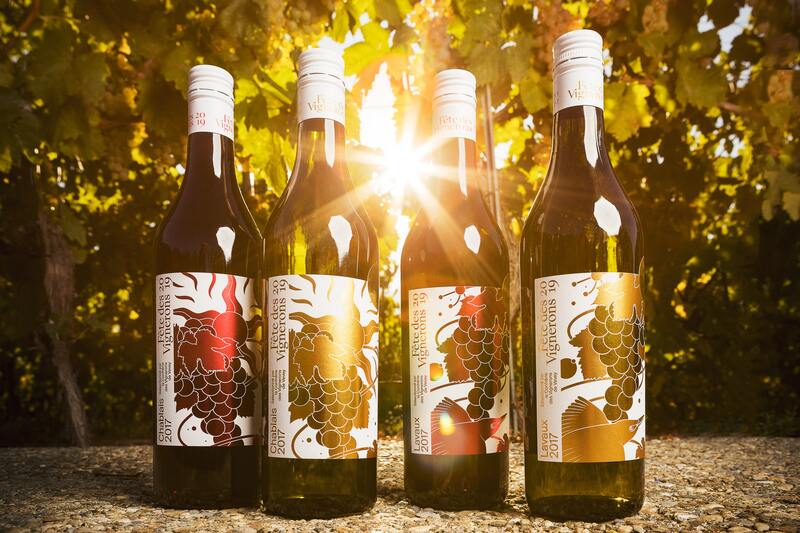 These premium wines will be available at the beginning of the festival. The grapes were harvested in vineyards selected from ones more regularly getting top marks in visits from experts of the Confrérie des Vignerons. Only 5000 bottles of each premium wine will be produced, including magnums. Prestige wines will be the vintage 2017, since these wines need to mature for longer. In addition to these two cuvées, the beginning of the festival will also see a rosé, sold exclusively in 50 cl bottles, an assemblage of Pinot and Gamay, PDO Vaud. A sparkling wine, essential to all celebrations, will indeed also appear at the opening of the festivities. The latter will be made from Chardonnay Vaudois, and will be offered at all establishments located within the perimeter of the festival. 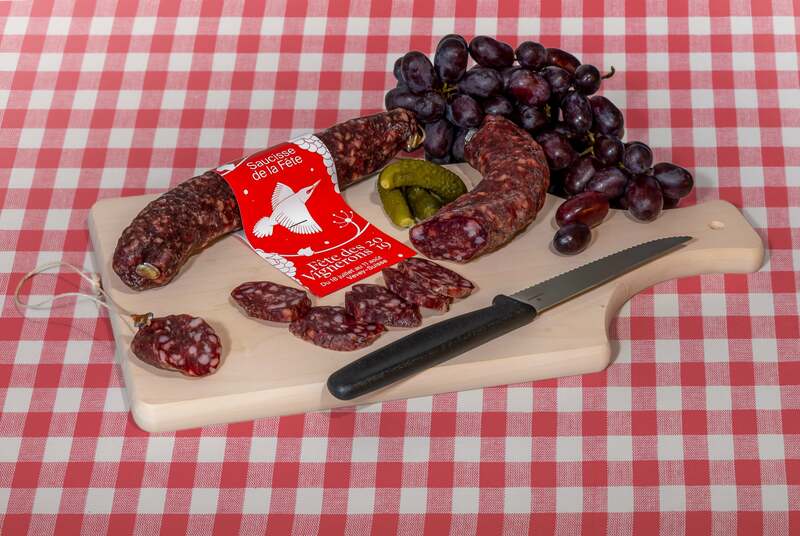 The Suter Viandes, a Villeneuve meat company, and the Fête des Vignerons have together created a festival sausage: a Swiss cured sausage of beef and pork that contains 5% festival wine, a blend of grapes from Chablais. This composition gives it not only a red and white look that recalls the visual red and white of the festival, but also a spicy taste that gives it its culinary kick. With a length of 15 centimetres (6 in), weighing 150 grams (5 oz), it will be available early April at Suter Viandes points of sale in French-speaking Switzerland as well as in Vaud supermarkets. The festival sausage will also be served on the Terrasses de la Confrérie from May 20 and on Swiss flights between June and August as part of a summer promotion of Vaudois cuisine.